Dr. Who and I have alot in common. We are both travelers. We're both optimists. And we are both 50 years old. Growing up I wasn't a big Dr. Who fan. There were only four channels and only one TV in our house. A person could only watch so much TV back then. It had to be shared and we couldn't record shows and watch them later. Dr. Who could be found on PBS but I wasn't sure when and at the time my PBS time was reserved for Monty Python. That being said there is some kind of cosmic connection here. I was the one who was born just prior to the first episode of Dr. Who but it is my kids who have really brought it back to life at our house. It has a similar feeling to the Hitchhiker's Guide to the Universe. The year that I turned 42 was an auspicious year. The kids didn't even question anything I asked them to do because the older two had read the book and they knew that the answer to life and the universe was "42". So, that was a good year. 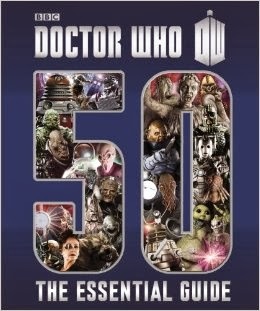 Now I am wielding my science fiction psychic connection with being the same age as the Doctor. Well not actually the same age. The Doctor reportedly is over 1100 years old. But I am exactly the same age as the TV show. And you know that when you have kids in the house, especially teenagers, you have to use whatever cool factor tool you can when you need it. I got a text message from my daughter today with a message about a new DVD she just got in the mail. It was better than she had expected. So I sent her a text message back that that was "Sick" and then asked her if I should use the word "Jiggy" instead. She sent me a text message back "Why don't you just stick with 'Awesome' ". 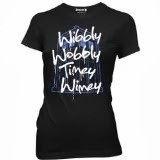 To celebrate the 50th anniversary I was considering getting a Dr. Who T-shirt but as a mature woman of 50 myself I'm not sure I want to wear a T-shirt with the words "Wibbly Wobbly" emblazened across my 50 year old chest. "D'you know, in 900 years of time and space I've never met anyone who wasn't important before." "Father Christmas. Santa Claus. Or, as I've always known him, Jeff." "You lot, you spend all your time thinking about dying. Like you’re going to by eggs or beef or global warming or asteroids, but you never take time to imagine the impossible: Maybe you survive." "I'm not really a cat person. Once you've been threatened by one in a nun's wimple, it kind of takes the joy out of it." "People assume that time is a strict progression of cause to effect, but actually from a non-linear, non-subjective viewpoint it's more like a big ball of wibbly wobbly time-y wimey stuff."